When I think back on my childhood, it’s hard not to think of TASIS because my association with the Flemings began at the age of five, so the school/camp and my formative years will always be inextricably entwined. I also have this dumb memory for things big and small, which means that I can remember the name of every single counselor I ever had, and just about every single kid I came in contact with at Frog Hollow Farm, the forerunner of today’s TASIS, and probably could serve as the Fleming Town Crier, if such a thing existed anymore or hadn’t been edged aside by more scurrilous things such as—what can I say?--Page Six. 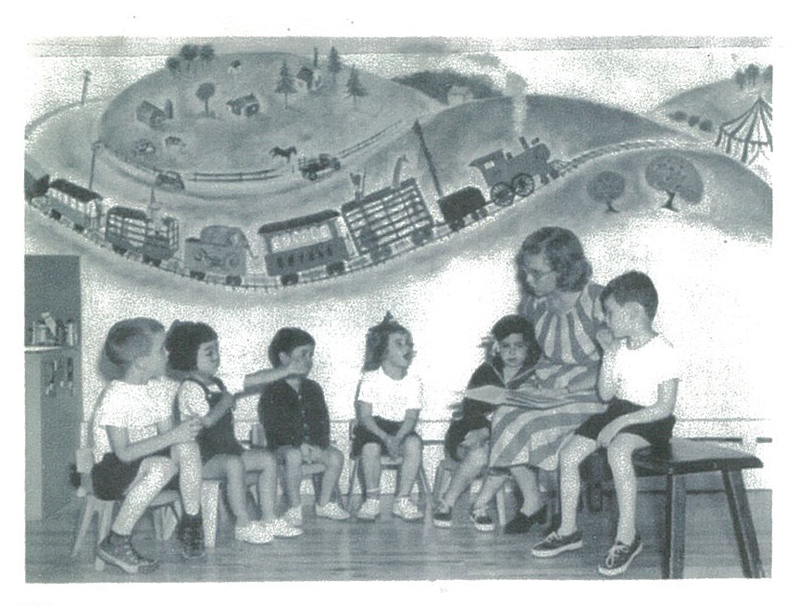 Jill, age 5 (left of teacher), at Frog Hollow Farm. I remember Pete Ceci, little brother to Lenny, who threatened to throw up if you made him eat anything he didn’t like, and by gum by golly, he did. I remember the beautiful counselor Pat who broke her finger while swinging on the swings made for—yup—five-year-olds but still managed to wear fancy red polish on her nails because her glamour was fair nigh indestructible, and I remember her male counterpart, the counselor Jim Alfred, who told us he got the scar on his back because he was shot at by Indians—and of course we didn’t doubt his story for a moment! I remember the song, “Twenty froggies went to school, down beside the swimming pool,” and I remember that very same swimming pool where we had our annual regattas—all dressed in crepe paper costumes with Sousa blaring in the background—but they were never as much fun as lying on our stomachs and simply sunning ourselves on the concrete edges that lined the water. I remember poor old (make that poor young!) Robin Waxwheeler who got poison ivy on his private parts, which, by the time he was discharged from the infirmary and the story had been disseminated from the boys’ cabins to the girls’ Playhouse, weren’t so private after all. I remember Milton Berle’s daughter was in my “cabin,” the Cottage, and he amused us by balancing a ball on his finger, which, though we were admittedly callow youths and had no idea we were in the presence of Mr. Television, was something up with which none of us were in the least bit amused, and I remember the name of my first boyfriend there, Jackie Barnes, because, even at the tender age of five, we knew that, if Mother Goose was to be believed, this Jack and Jill were destined for each other for all eternity …though, truth be known, and I remember to this day a tiny scar he had over his upper lip, I never saw him again for the rest of my life. Jill has come a long way—in camel years—since her days at Frog Hollow Farm. All of which goes to say that when Mrs. Fleming decided to branch out overseas, and move her holdings to Switzerland in the mid-50s, our family was among the first to be in on the act. Well, almost. Unfortunately, the year Mrs. Fleming decided to open a dazzling little camp called Swiss Holiday, which was another incarnation of TASIS, was the same time my parents decided it would be “broadening” (parents thought in those terms in those days) if my sister and I went to—big stretch of the imagination here—a real Swiss school in Switzerland. I would have much preferred going to Swiss Holiday instead, but—again in those days—while children were allowed to speak their minds, they were very rarely listened to, so the closest I got to Swiss Holiday was going over with them on the plane trip ride to Switzerland, after which we would both go our separate ways—the Fleming crew to a lovely picturesque little village named Gryon, and my sister and I to a dungeon in Lausanne. I remember the Swiss Holiday uniform, however—khaki bermudas, a white knit Izod-type shirt, and a black cardigan, which was very creative at a time when most kids went to camp in nondescript navy blue T-shirts and shorts. I also remember my best friend from childhood, Jill Goodson (another “Jill” here—go figure), was enticed to go, but the only time I got to see her again that summer was when the Swiss Holiday crew bumped into the inmates from Lausanne on the famous boats that ferried between Ouchy and Montreux on Lac Léman--that’s Lake Geneva to you heathens—and I could tell that my best friend was now Gay Fleming’s best friend, which meant that I had lost out on a whole lot more than not getting to go to Swiss Holiday.